The police chief of Alexandria, Virginia, says one of the first officers to respond to a shooting that left a leading House Republican critically wounded was pinned down by a barrage of gunfire. 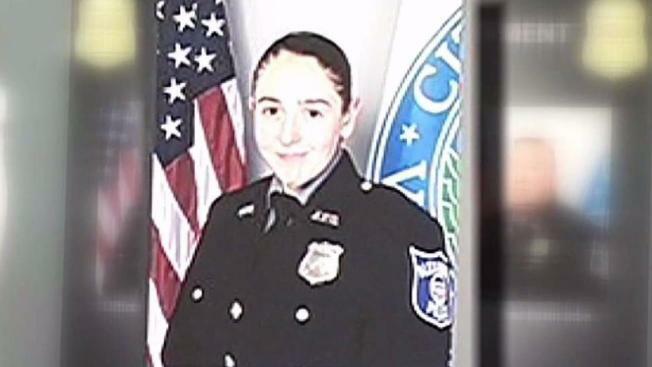 Alexandria Police Chief Michael Brown on Monday praised what he called the heroic actions of Officer Nicole Battaglia and two others who arrived just minutes after the gunman began shooting at members of Congress on a baseball field last week. "You can't teach the kind of instinct that I saw with the three officers here," Brown said. "Frankly, it's a test that all of us will get when we get that call. We all think about that when you put the badge on." Police officers and medics in Alexandria heard gunshots and headed toward the shooting before they were dispatched. Brown says Battaglia drew the gunman's fire and took cover behind parked cars, allowing two other officers to return fire. He says the gunman was "neutralized" quickly. U.S. Capitol police officers also fired at the gunman. Authorities have not revealed which officers fired the ultimately fatal shots. "I'm damn proud of them," Brown said. The shooting left Rep. Steve Scalise of Louisiana critically wounded. Witnesses at the field for Wednesday's early-morning practice described a terrifying scene, with the gunman reloading while standing on the field and the wounded congressman "screaming for help." "Everybody probably would have died except for the fact that the Capitol Hill police were there, and the only reason they were there was because we had a member of [House] leadership on our team," Kentucky Sen. Rand Paul told MSNBC. Scalise, a Republican from Louisiana, was shot in the hip. His condition has been upgraded from critical to serious as his health continues to show improvement, according to a statement from the MedStar Washington Hospital Center. Capitol Police officers are being hailed as heroes Wednesday for facing down and killing a gunman who had wounded four others. News4's Shomari Stone has their story. Lobbyist Matt Mika was shot multiple times and remains hospitalized. Capitol Police Special Agent Crystal Griner, who was shot in the ankle, and Zack Barth, an aide to Rep. Roger Williams (R-Texas), who was shot in the calf, were treated and released from hospitals. The gunman was identified as James Hodgkinson, 66, from Belleville, Illinois. Both local and Capitol Police shot at him; he died at a local hospital. Sen. Bernie Sanders said Hodgkinson had been a volunteer for his presidential campaign. Sanders said he was "sickened by this despicable act" and condemned the shooting "in the strongest possible terms." Hodgkinson, a home inspector who had been living out of his van near the park, had a social media page filled with criticism of Republicans and the Trump administration. Investigators said last week that Hodgkinson had obtained his rifle and handgun from licensed firearms dealers. Capitol Police said they had "no evidence to suggest that the purchases were not lawful."